I’ve found that our family does a great job of memorizing anything that I have on a cute little flashcards. We carry these flashcards everywhere and review them over meals, while waiting in line anywhere, in front of grandparents, etc. I’ve also found that if I don’t have it on a flashcard, we really struggle to get it memorized. 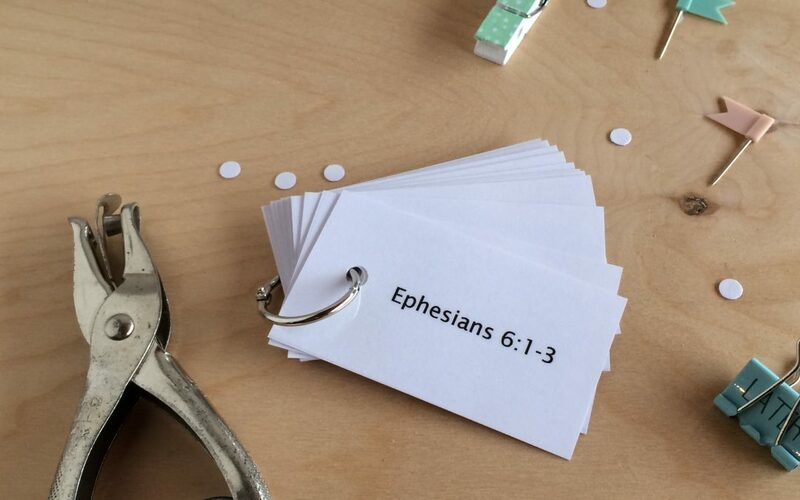 This year, I’m determined to memorize Ephesians 6 so I made flashcards! In our home, we’re memorizing the chapter in 12 weeks, but I went the extra mile and made flashcards for 12 OR 24 weeks. I also created the flashcards in both KJV and NIV. You’ll find both an MS Word file and an identical PDF with Ephesians 6 on them, ready to print with very faint cutting guide lines. The flashcards are designed to be printed double sided. I printed mine on cardstock, laminated, cut and then hole punched them. The finished cards print as 2″ x 3.5″. I hope you enjoy them and they make your memory work easier! I’ve also written out all our hand motions for Ephesians 6 and made them available in a free download!